For RAF-AVIA flights the maximum size for carry-on baggage is 50x35x16 cm (LxHxW). The maximum weight of carry-on baggage cannot exceed 6 kg. Hand luggage must be stowed under the seat in front of you or in the locker above your seat. For RAF-AVIA flights the maximum size for checked-in baggage is 100x50x80cm. The maximum weight of checked-in baggage cannot exceed 20 kg. Depending on the route, the baggage weight might change. Some substances and materials rated dangerous may be transported according to dangerous goods for transportation regulation. These containers must be brought to the airport contained in a single, transparent, re-sealable plastic bag, which itself must not exceed 1 liter in capacity (approximately 20cm x 20cm). Medicines, baby milk and baby food enough for the whole journey. You may be asked for proof of authenticity. Duty-free goods in a sealed security bag. The item and the receipt must remain sealed inside the security bag provided at the time of purchase. Each passenger may carry only one such bag of liquids. The bag must be presented for examination. Liquids that cannot be placed inside the re-sealable bag must be packed into checked baggage. Liquids of any amount can still be carried in luggage checked into the aircraft hold. The primary task of baggage is to protect its contents from damage. Baggage processing at the airport involves rapid physical handling, which causes normal wear and tear. RAF-AVIA is not responsible for minor damage to checked baggage which does not render the baggage unusable. The airline’s responsibility for damage that happens to checked baggage is internationally limited accordingly Regulation (EC) No 889/2002 of the European Parliament and of the Council of 13 May 2002 amending Council Regulation (EC) No 2027/97 on air carrier liability in the event of accidents. A passenger can benefit from a higher liability limit by making a special declaration at the latest at check-in and by paying a supplementary fee. RAF-AVIA recommends passengers to insure all baggage. ICAO-Technical Instructions permit the carriage of the dangerous goods listed below by passengers either as or in carry on baggage or checked baggage or on their person. An approval is not required for those dangerous goods which, according to the Technical Instructions, can be carried by passengers as showed at the table below. Additional restrictions implemented by countries in the interests of aviation security may, however, limit or forbid the carriage of some of these items. Some dangerous goods which may be carried by passenger require approval by RAF-AVIA Airlines for carriage on one’s person or checked baggage. Approval can be issued by RAF-AVIA only after thorough check of the information about planned goods for carriage. Request for approval shall be sent to RAF-AVIA Operations (rafnavi@rafavia.lv) at the latest 24 hours before the flight. Do not put Samsung Galaxy Note 7 devices inside the checked baggage. Keep the devices turned off and not charge them at any time to eliminate the risk of the phone’s battery catching fire. RAF-AVIA remind passengers immediately inform the cabin crew when a device is damaged, hot, produces smoke, is lost, or falls into the seat structure. Sitting in Emergency Exit rows. Passengers seated in emergency exit row seats will be requested to assist during an emergency evacuation under instructions of cabin crew for the safety of all passengers. At RAF-AVIA, we do everything we can to make your child’s travelling experience as safe and comfortable as possible. Baggage allowance per infant is 10 kg. Your infant will receive a special infant seat belt to be used in conjunction with your own seat belt. Please note that RAF-AVIA is not able to provide child seats. You may bring on board an approved child seat, provided that there are free seats on the flight in question. You may also want to consider ensuring a seat for your child by purchasing the child fare. If you’re travelling with children, remember to bring everything they’ll need for the journey, like nappies, baby food, etc. RAF-AVIA can’t accept Unaccompanied Minors (5–11) service. In order to travel after the 28th week of pregnancy, a doctor’s statement of normal pregnancy is required. The statement can be obtained after the 27th week of pregnancy. The statement doesn’t have to be sent to the airline before the departure, but must be taken to flight. If passenger will not be able to show it at check-in, Airline may deny boarding on the aircraft. Please note that these instructions are for RAF-AVIA Airlines flights. Pet shall not exceed 5 kg with container. If deemed necessary, the airport staff or the crew may order removal of the pet from the cabin. Only bookable via rafnavi@rafavia.lv at the latest 24 hours before flight. The same restrictions as Traveling with Animals. It is possible to travel with a wheelchair on RAF-AVIA’ flights. No excess baggage charge is levied for a wheelchair. We require information about a passenger travelling with a wheelchair when the trip is booked, so that we can properly anticipate the need to provide help at different stages of the journey. RAF-AVIA will transport all equipment (excluding wheelchairs with spillable batteries) that a person with reduced mobility needs for his or her well-being, provided the passenger informs of such equipment at the time of trip reservation and we are able to confirm that there is room for the equipment in the hold of the aircraft. Information about a passenger’s need for assistance during his or her journey is conveyed through the reservation system to airline and airport staff. RAF-AVIA require information about the need for special assistance at the latest 24 hours before the flight departure, so that we can ensure the availability of such assistance. Ideal for groups! You want to organize a factory tour in France or a public relations event in a European subsidiary? 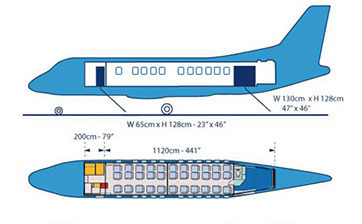 The ATR 42 is a modern aircraft, perfectly adapted to transport groups of 46 people on personalized trips. The ATR 42 also allows use of secondary airports not served by regular flights. The passenger configuration of SAAB 340 is favourite among airline passengers due to its fexibility, comfort and reliable performance. The cost-effective SAAB 340B consistently generate profit for a wide range of regional air transport services. FIND OUT THE PRICE OF YOUR FLIGHT!